The danger of climate change continues to be widely misunderstood and ignored. The COP21 of Paris is starting and trying to gain a slot in the mediaspace. But, at best, it will be a short flare of attention; soon fading in the general indifference. Climate change, it seems, is seen as something remote; its importance dwarfed by more immediate threats; from terrorism to financial concerns. And governments seem to suffer from a split personality disease; with politicians flocking to Paris to declare the absolute need of saving the planet for the future generations and then going back home and declare the absolute need of restarting growth. But the climate threat is not for the future generations. 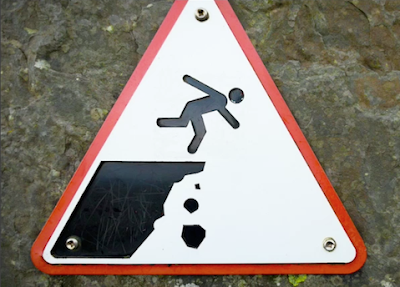 It is something that's going on now, that has been going on for a century, and that keeps going, taking us along a dangerous path that ends somewhere, probably with a steep cliff. Here is a summary of the situation as it is today. It doesn't attempt to be exhaustive, but it tries to catch the main points of what's going on. 1. Temperatures. Climate change is not just about rising temperatures, but that's probably its most direct and visible manifestation. The earth as been getting warmer and warmer during the past century or so and, today, the so-called "pause" is over, if it ever existed. 2015 is on track to be the hottest year ever recorded, with good chances that 2016 will be even hotter. We are very close to, or we have passed, 1°C of average surface temperature increase in comparison to pre-industrial times. The effects of this warming are multiple: droughts, heat waves, glacier melting, sea level rise, and more. And the more the earth warms up, the more these effects are important. 2. Greenhouse gases. Carbon dioxide and methane are the main greenhouse gases generated as the result of human activities. Their buildup in the atmosphere continues. About CO2, 2015 was probably the last year in history when humans could breathe an air containing less than 400 ppm of it; from now on, concentrations will be higher. We don't know what effect these concentrations will have on people, but we know that humans had never experienced an atmosphere with more than 300 ppm of CO2 during the more than a hundred thousand years of their existence as a species. We also know that the human cognitive process is already measurably impaired at concentrations under 1000 ppm. Regarding methane, concentrations are also rising after a period of stasis that had lasted until 2006. There exists the worrisome possibility that increasing temperatures will generate a "tipping point" in which the release of methane trapped in the high latitude permafrost would become an independent and out of control source of greenhouse gas. So far, there is no evidence that this is happening, but there are worrisome reports of bursts of methane released from craters in Siberia. 3. Ice melting and sea levels. The melting of the icecaps and glaciers continues unabated. The risk of some major instabilities exists, for instance in Antarctica; even though no spectacular events have occurred, so far. Some studies seem to indicate that Antarctica has been gaining some ice up to 2008 owing to increased snowfall but, even if that turns out to be true, the overall melting trend is evident. The melting of continental glaciers is destabilizing the mountains, causing extensive landslides. The freshwater flow into the oceans is one of the main factors causing a rise in sea levels. At present, we stand at a level some 20 cm higher than when the measurements started, in late 19th century. So far, no coastal city or inhabited island has gone underwater permanently, but if the rising trend continues this is going to become a gigantic problem. 4. Weather and climate related disasters. The changing weather patterns are one of the factors that have generated a rapid increase in natural disasters during the 20th century. The number of disasters appears to have peaked around 2004-2006, even though the damage done keeps increasing in monetary terms. The change in weather patterns is causing considerable damage to agriculture, affected by droughts (as it is happening in the US) and by unstable rainfall patterns. So far, food production has not been heavily impacted, at least on the average and the production of cereals remains stable, or even increasing. However, poor countries are especially at risk since farmers do not have the financial resources needed to adapt. Fishery production is in decline almost everywhere, mostly because of overfishing, but also as a result of oceanic warming. 5. Other effects. All the above are effects that can be classed under the "climate change" label, in turn an effect of the warming caused by greenhouse forcing. However, the ongoing changes in the ecosystem are much more complex and extensive. For instance, oceanic acidification is taking place as an effect of dissolved CO2 to a level of some 0.1 pH units and that may already have negative effects on corals. We would need to consider eutrophication, soil erosion, heavy metal dispersal, land coverage by permanent structures, multiple extinctions, deforestation, and much more. Even though short, this list shows how gigantic and mostly irreversible changes are taking place. The earth changing, it is being transformed into a different planet, an environment that our ancestors never experienced, but that we cannot avoid facing. In this situation, a certain degree of adaptation is certainly possible for humans. Air conditioning can help against heat waves, agriculture can adapt to droughts by irrigation or by switching to different varieties of plants, engineering works can help against flooding, and fires can be suppressed by various methods. But there are limits to adaptation and the problems tend to come not gradually, but all of a sudden. For instance, when New York suffered a disastrous flood, in 2012, the sea level rise was certainly a factor that worsened the problem. In many cases, we are seeing a situation in which major climate-related emergencies could occur at any moment. There are various possibilities; such as a new heat waves comparable, or worse, than the one in 2003 that claimed some 70,000 victims in Europe. We may see the collapse of major chunks of ice from Antarctica or from Greenland, that would lead to a disastrous sea level rise. Or changes in the weather patterns badly affecting agriculture and hence food production. Or something else; in any case, as the greenhouse forcing continues to increase, these possibilities become more and more likely. Capping all this, there is the ominous possibility of the "climate tipping point", the fact that after reaching a certain degree of warming, the whole ecosystem will start releasing methane stored in the permafrost, pushing itself to a new temperature state. This new state could be so hot to make most of the planet uninhabitable for human beings. Obviously, there is no way to adapt to such an event. Against all this, the efforts of the conference of Paris appear unlikely to have a large effect, to say the least. The conference is not supposed to reach any binding agreement and there is little chance that it will arrive to an agreement sufficiently strong to ensure that temperatures will remain within the "2 C" warming limits, even assuming that such a level could be considered "safe." Last month, Kevin Anderson published a very interesting article on "Nature Geosciences" (12 Oct 2015). The article may be behind a paywall, but most of it is reported in Anderson's blog. Let me summarize it for you because it goes to the heart of the problem: the transition is NOT going to be easy, as many people say. Installing double paned windows and using hybrid cars will not be enough; not at all, at least as long as we want to maintain business as usual in terms of economic growth. If these up-beat — and largely uncontested — headlines are to be believed, reducing emissions in line with a reasonable-to-good chance of meeting the 2 °C target requires an accelerated evolution away from fossils; it does not, however, necessitate a revolutionary transition in how we use and produce energy. Such conclusions are forthcoming from many Integrated Assessment Models, which are key tools for informing policy makers of alternative climate change futures. In most Integrated Assessment Models, 2 °C carbon budgets are effectively increased through the adoption of negative-emission technologies. These technologies are currently at little more than a conceptual stage of development, yet are ubiquitous within 2 °C scenarios. Nowhere is this more evident than in the IPCC's scenario database. 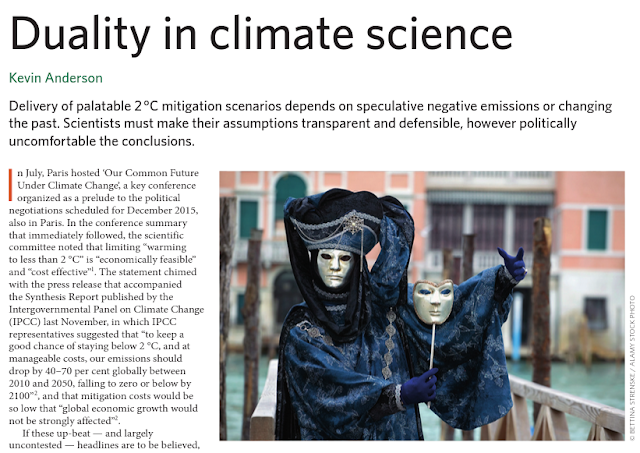 Of the 400 scenarios that have a 50% or better chance of no more than 2 °C warming (with three scenarios removed due to incomplete data), 344 assume the successful and large-scale uptake of negative-emission technologies. Even more worryingly, in all 56 scenarios without negative emissions, global emissions peak around 2010, which is contrary to available emissions data. In plain language, the complete set of 400 IPCC scenarios for a 50% or better chance of 2°C assume either an ability to travel back in time or the successful and large-scale uptake of speculative negative emission technologies. A significant proportion of the scenarios are dependent on both ‘time travel and geo-engineering’. I conclude that the carbon budgets associated with a 2 °C threshold demand profound and immediate changes to the consumption and production of energy. .....there remains an almost global-scale cognitive dissonance with regards to acknowledging the quantitative implications of the analysis, including by many of those contributing to its development. We simply are not prepared to accept the revolutionary implications of our own findings, and even when we do we are reluctant to voice such thoughts openly. There exists, indeed, a diffuse attitude in the scientific community that we shouldn't alarm people about the climate disaster, that if we do that people will simply run away while plugging their ears and singing "la-la-la" and that, therefore, we should keep saying that it is just a question of some adjustments in our ways and that everything will be fine. That approach hasn't worked out very well so far and I think it is time to change strategy. Years ago, President Kennedy said that if we are going to the Moon, "it is not because it is easy, but because it is hard." And that worked out. Avoiding the climate change disaster is surely hard, but not impossible. There are ways, if we are willing to make sacrifices. The "Syrian Sickness": what crude oil gives, crude oil will take away. 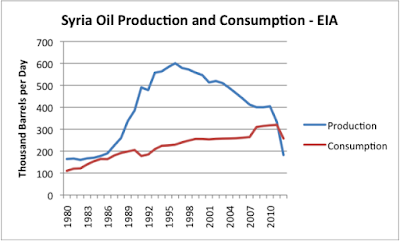 Here, I argue that the origins of the Syrian collapse are to be found in the economic downturn generated by the gradual depletion of the Syrian oil reserves. Crude oil had created modern Syria, crude oil has destroyed it. This phenomenon can be termed the "Syrian Sickness" and the question is: "which country will be affected next?" Crude oil is a great source of wealth for the countries that possess it. But it is also a wealth that comes as a cycle. Normally, the cycle spans several decades, even more than a century, so that those who live through it may completely miss the fact that they are heading to an end of their wealth. But the cycle is faster and especially visible in those areas where the amount of oil is modest; there, wealth and misery appear one after the other in a dramatic series of events. One of these rapid cycles of growth and decline is that of Syria. It is a country that never became a major world producer, its maximum output was less than 1% of the world's total production when it peaked, around 1995. (graph below, from Gail Tverberg's blog). For the small Syrian economy, however, even this limited amount was important. 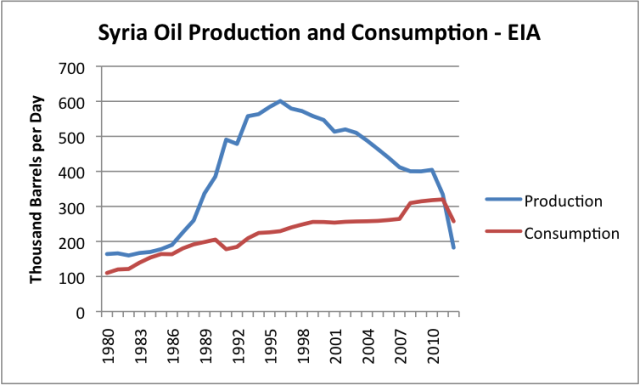 The Syrian oil production went through its cycle over little more than three decades. Depletion generated progressively higher production costs and that led to a scarcity of capital investments to keep production increasing, eventually forcing it to decline. 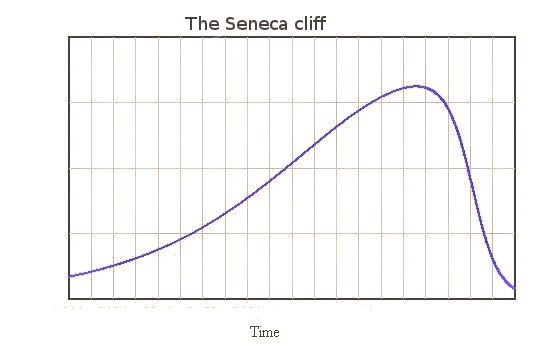 The result was the "bell shaped" production curve that is often called the "Hubbert curve". Around 2011, the internal consumption curve crossed the production curve and that transformed the country from an oil exporter to an oil importer. The cross-over point corresponded to the start of the civil war. The IMF data show that the Syrian government's budget was still 25% dependent on oil in 2010. Data on what it was earlier on are hard to find, but it is clear that it must have been much larger. It may well be that, at the time of the peak, most of the government's revenues came from oil. Seen in this light, it is not surprising that the complete loss of these revenues generated a big turmoil. So, we can build up a narrative of what happened in Syria after the peak. With progressively lower oil revenues, the government was less and less able to afford the bureaucracy and the social services it used to provide. Gradually, it became also unable to afford an efficient police force and a functioning army. The middle class, that had been strongly dependent on the government's handouts, was badly hit. The most educated and wealthy ones left the country or, at least, moved their financial assets abroad. Those who were forced to remain saw their assets destroyed by hyperinflation and became an impoverished urban proletariat. At the same time, the countryside also went through an economic disaster, enhanced by the droughts created by climate change. At this point, a large number of young men, unemployed and without hope for the future, become cannon fodder for religious fanatics and for local warlords, often paid by foreign powers interested in carving out the country in pieces to be distributed among themselves. 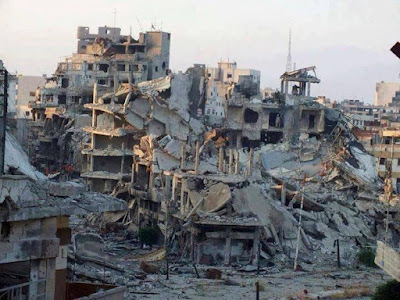 The destruction of whatever was left was also helped by economic sanction and aerial bombardments. The final result is what we see: the "Syrian Sickness." A nearly terminal form of social sickness; it is hard to imagine when and how Syria will be able to recover even a shade of its former wealth and stability. 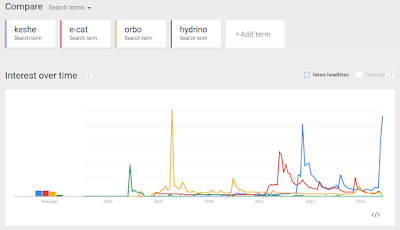 There are several other examples of minor oil producers that went through similar cycles. Egypt, for instance, experienced the cross-over of production and consumption in 2010, experiencing a phase of dramatic civil unrest. Egypt, however, did not collapse; most likely because the importance of oil in its economy was not as large as it was for Syria. Other examples of countries that experienced the cross-over are Malaysia and Indonesia, also undergoing internal troubles, but no generalized collapse. No country is completely immune to the Syrian sickness, but some are less sensitive to it. So, some oil producers, such as the United Kingdom went through the cross-over point without suffering evident disasters; but the dependency of the UK government on crude oil was only 2% in 2011. At this point, the question is obvious: given the known cases of Syrian Sickness, given that depletion is unavoidable, which country is next in line? There are several candidates for a future crossover of production and consumption, but none seems to be very close to it. Venezuela, Iran, and Mexico may be the producers most at risk; but the critical moment may still be several years away in the future. But the most interesting and worrisome case is that of Saudi Arabia. The data shown below are from Mazamascience. 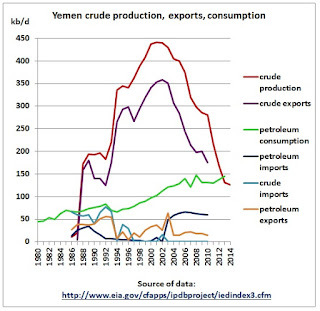 Most producers of the Arabian peninsula (with the exception of Yemen) show a similar pattern. You see that, despite the rapid increase in internal consumption, Saudi Arabia is still able to export about two thirds of its production. But how about the future? Of course, extrapolations are always dangerous, but it doesn't seem that the production and consumption curves are destined to cross each other very soon. Hence, the country might still have at least a couple of decades of substantial oil export revenues. The problem is that the Saudi economy is heavily dependent on oil: 90% of the government revenues come from oil. So, Saudi Arabia may not need to go through the cross-over point to start experiencing troubles. Consider that it is nearly completely dependent on imports for the food its population consumes, and that the trend is worsening because of the depletion of local aquifers. You can imagine what the problem could become in case of a substantial loss of financial resources coming from crude oil. If Saudi Arabia starts suffering of the Syrian Sickness, the result disaster may make the Syrian collapse look like a children's game. Is there any hope for Saudi Arabia or any other producing country to avoid the Syrian Sickness? There are several ways to postpone or reverse the decline of oil production if sufficient financial resources are available. However, these are just stopgap measures: depletion is an irreversible process. A country can only prepare for it by building an alternative economic infrastructure while it is still possible; an opportunity that was missed in Syria. Today, Saudi Arabia doesn't lack the financial resource for massive investments in renewable energy, that would provide an alternative to the collapse created by depletion. Unfortunately, it doesn't appear that these investments are being made, with the Saudi government preferring to engage in expensive military power games. That's a bad idea not only for Saudi Arabia, but for the whole world: with more than 10% of the world's oil consumption provided by producers in the Arabian Peninsula, you can imagine what might happen if the region falls victim of the Syrian Sickness. 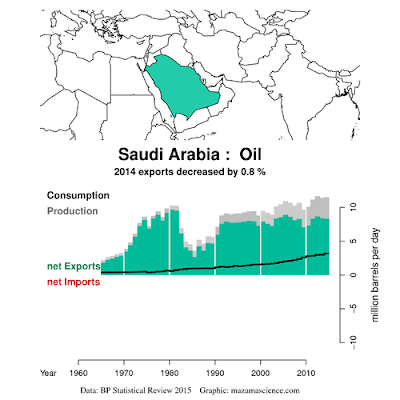 Crude oil has given a lot to Saudi Arabia, crude oil can take back a lot from it. But there is something that crude oil can never provide, and it is wisdom necessary to manage it well. Rediscovering the Legacy of a Prophetess: Cassandra is back! "Cassandra's legacy" is again the name of this blog. In March 2014, I had changed it to "Resource Crisis," hoping that a more serious name would promote a rational debate on the question of mineral depletion. Unfortunately, that turned out to be a misplaced hope. While depletion becomes progressively more and more of a burden for the economic system (and there is no way that it could be otherwise) the debate on this subject remains conspicuously absent from the media; even more so with the recent fall in oil prices. Instead of being taken for what it is, a symptom of something deeply wrong in the market of mineral commodities, it has been hailed as the definitive demonstration that "peakers" were wrong and will always be wrong. And the same is true for climate change: the recent events in Paris have totally marginalized the issue. It will take some time before we can return to a rational view of the world - if we will ever manage that. Even in the midst of the general disaster, however, I am happy to return the name of the blog to a modest homage to the figure of Cassandra. She may never have existed but, even so, she remains for us an example of courage and of strength. And she was always right with her prophecies, even though nobody believed her - but they should have. So, welcome back, Cassandra! I can also offer to you something that I wrote earlier this year and that I published in my "Chimeras" blog: a short story titled "An Interview with Cassandra." See? When I say that I like Cassandra and her story, I am serious! I don't have to tell you that this story is a work of fantasy, but several details are taken from modern historiography, for instance the character of the Hittite king Mutawalli, the possible contemporary events of the battle of Kadesh and the fall of Troy, the habits of the Babylonian temple priestesses, and more, including the fact that Hittite is a language vaguely related to English and an attempt of inventing a Sumerian root for the name "Cassandra", whose etymology is unknown. You may also like to know that this story came to my mind, nearly complete, while I was mounting some bookshelves at home; maybe I have to consider it as a gift from the Goddess Ikea. After that I had googled "summoning spells" on the web, I found one that I liked. I needed some peculiar stuff to perform it, including crocodile liver, platypus' whiskers, bat's earwax and more. But once I got all that (via Amazon.com), I thought I could try. And, immediately, there materialized in front of me, right in my office, a translucent image of a dark haired lady wearing gold jewels and a curious dress. 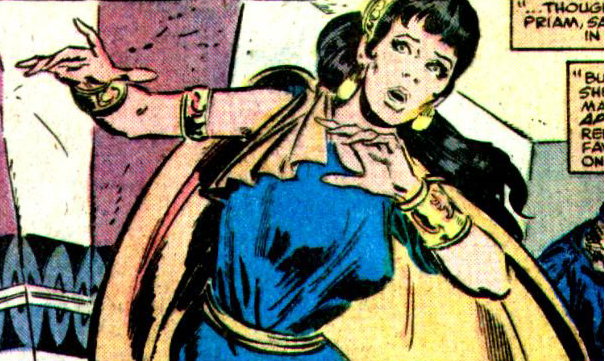 No less than the ghost of Cassandra, the Trojan prophetess. And I could interview her! You too can fight terrorism! The roar of the energy midgets: Keshe beats Rossi hands down. It seems strange, at first sight, that Mr. Keshe can obtain so much success with his unlikely inventions for which as he gives no details, no explanations, no justifications, no nothing; and he proclaims himself to be the Messiah, to boot! Instead, Rossi's supporters are often able to talk glibly and ponderously about such things as "a new physics" or about their home-made version of quantum mechanics. They can also discuss at length about nuclear reactions that do not occur (by Rossi's own admission) in the E-cat device. Rossi himself can set up impressive electric water boilers in his lab, and even sell larger versions of them. Yet, he doesn't seem to be able to keep the attention on his E-Cat as high as Keshe does for his devices. So, what is Keshe's trick? I think there is an explanation. When selling free energy devices, it is important to select one's customers and Keshe must know very well that there are plenty of people, out there, who, not only can be tricked, but actually want to be tricked. So, Keshe uses one of the simplest and best known tools of advertising: that of luring customers by giving away something for free. It is what Santa Claus does and Keshe, indeed, positions himself as the Santa Claus of the unlikely energy sources. In addition to considering himself a supernatural being, he claims that he is giving his inventions away for free; a gift to humankind. It works. In the end, what we learn from Keshe is that the people who hope in these devices are still believing in Santa Claus. Below, Keshe beats not only the E-cat, but also other free energy devices such as the Orbo and the Hydrino! Click to enlarge. What were the real origins of the great oil crisis of the 1970s? Politics or depletion? If you happen to be caught in a boat in a major storm, such as in this image by Hokusai, you'll surely think you experiencing a major shock. However, it is also true that no storm changes the average water level of the oceans. So, the oil storms of the 1970s were perceived as major shocks, but did they change the average patterns of the world's oil production? In this post, I argue that they didn't. Just like a sea wave has to crash on a shore, sooner or later, so oil production had grown so fast in the 1950s and 1960s that it had to crash, sooner or later. And it did. The oil crisis that started in the early 1970s is still widely remembered today and much of the interest in the vagaries of the present oil market is derived from a comparison with the events of that time. Yet, it may also be that the crisis was widely misunderstood while it was taking place and that it remains misunderstood even today; often reduced to the work of a small group of evil Arab sheikhs, perhaps the ancestors of today's Daesh. But, as it often happens, every question may have an explanation that is simple, obvious, and totally wrong. Last week, there was a meeting at the University of Venice, Italy, dedicated to this issue: what were the origins of the oil shock and of the countershock of nearly half a century ago? The conference collected for two days experts in subjects such as political science, economics, communication science, history, and more and I won't even try to summarize for you all what was said. Suffice to say that even after you study a subject for 15 years (as I did with peak oil) there are always chances to learn something new that you didn't suspect before. I emerged out of the meeting with the understanding that there was an important political and human side to the great oil crisis. Yet, I remain convinced that there are deeper factors; those factors that people call "fundamentals." And, when dealing with a mineral resource, crude oil, depletion is the fundamental factor. Not that I pretend to have "the" answer to the origins of the great oil crisis of the 1970s, but I can't avoid to note that the magic word "depletion" was almost never mentioned at the meeting. It is the usual problem: depletion remains a widely misunderstood concept. For the oil industry; as long as their books list "reserves" existing somewhere; then the problem is not considered to be of any importance. And, for historians, if oil production restarted after the crisis, then it means that there never was any lack of oil and, as a result, the crisis must have had political or financial reasons. But depletion doesn't mean "running out" of anything; it is a gradual phenomenon that was already strongly affecting the oil markets at the time of the crisis. Looking at this graph, I was struck by a curious thought. 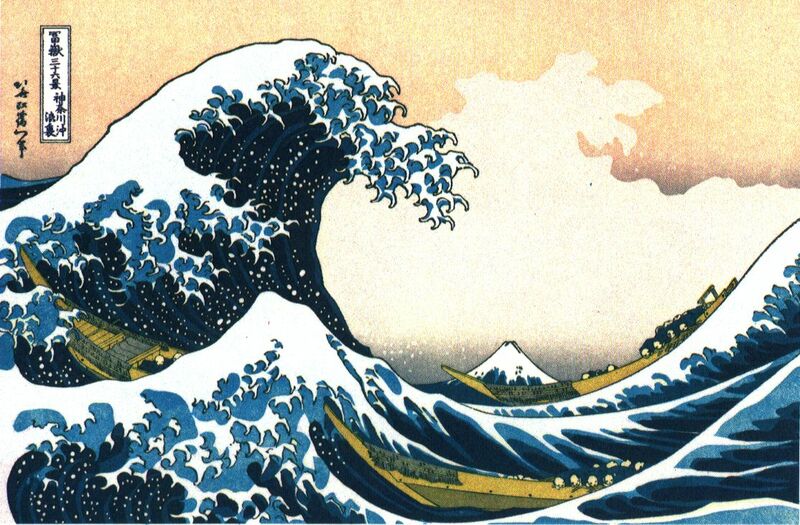 There came to my mind Hokusai's famous "great wave" image, you see it reproduced here, on the right. Note the shape of the oil production curve for the period from about 1950 to 1980; doesn't it look like an ocean wave that grows and then crashes down? From 1955, for some 20 years, Iran's oil production doubled approximately every 5 years; something that corresponds to a yearly growth rate of about 15%. And now ask yourself: how long can anything double every five years? If you think about that, it makes little sense to ask why Iran's production collapsed; it had to. Just like an ocean wave, it had to crash down sooner or later. Keeping oil production rising for a longer time would have needed not only to match investments to the rapid doubling rate, but also to increase them further in order to overcome the progressive depletion of the "easy" oil resources. Iran was not running out of oil; it was running out of the capital resources needed to extract it. So, I think that the conventional explanation for the collapse of Iran's oil production is wrong: it is not correct to say that it collapsed because of the revolution. But it would be just as wrong to say that the Iranian revolution was caused by the production collapse. The two phenomena went together and reinforced each other; one more example of another misunderstood concept: that of "enhancing feedback". The same phenomenon affected the Soviet Union, but Iran turned out to be more resilient: the country survived the revolution, the oil shock, economic sanctions, and a major war. 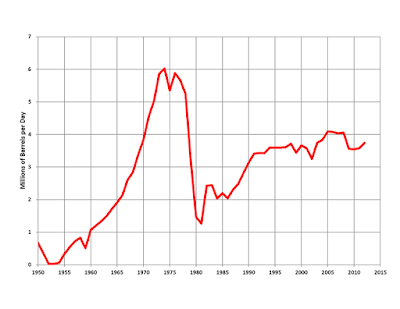 Slowly, Iran reached a new stability, the oil industry was rebuilt; and Iran became again an oil exporting country, even though it never reached the peak level of 1979 (and probably never will). The interest in the great oil crisis of the 1970s-1980s is not just a game for academic historians; it is something that has deeply affected the world's history and it is still affecting our perception of the factors affecting the supply of crude oil that, today, we need as much, and even more than, we needed it at that time. So, there is a crucial question to ask: could we see another great oil crisis in the near future? As always, the future is obscure, but at least not beyond all conjecture. Today, we don't see in any country (with a single exception) oil production growing so rapidly as it was the case for Iran and others before the great crisis. Hence, it seems unlikely that we'll see again an abrupt crash (apart from the above exception, which seems to be already crashing). Nevertheless, the problem of depletion remains, and it can only grow bigger as more oil is extracted and burned. So, we are heading toward a difficult future; we may not see another "oil shock", but an "oil decline", even a rapid one, very likely, yes. 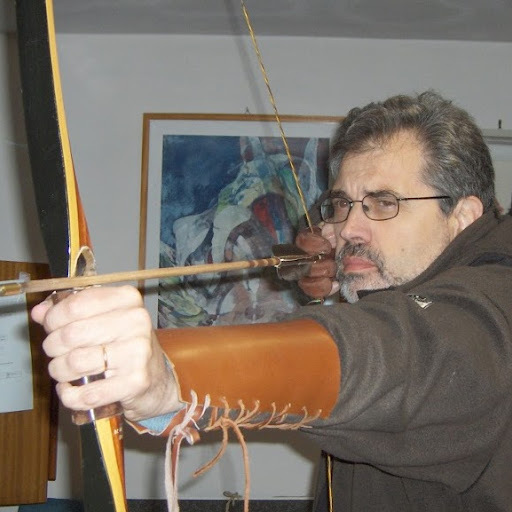 H/T to the organizers of this excellent meeting, Duccio Basosi, Giuliano Garavini and Massimiliano Trentin. Obviously, the images of this gigantic glacier calving not prove anything in themselves. In this clip, you have to go to minute 4:20 to see a quantitative assessment of how the ice melting rate has accelerated in a century or so. And, yet, if you go to the YouTube page of the clip, you see something unexpected. It may be just an impression of mine, but it seems to me that the comments of deniers are few and unable to hijack the discussion; as, instead, it normally happens every time you try to argue for the scientific basis of climate science. In short, these images are not only impressive, they are also effective in driving home a basic point: global warming is changing our world; it is changing it deeply, it is doing that now. Most of us do not think in equations. We tend to think, rather, in terms of images and associations. And we believe in something when we see it happening, not when it comes a prediction of some complex mathematical model. As climate change progresses, it becomes more and more evident: you can see its effects around you with your eyes; just as you can see with your eyes this giant glacier calving. So, if you have a chance, try to watch the whole movie, "Chasing Ice" by James Balog. It is beautiful, incredible, eerie, and terrifying. We need more movies like this one! We are one month away from the COP-21, in Paris, that should change everything - and will probably change nothing relevant. But change does occur, even though in ways that often surprise us, and in ways we may not like to see. The past decade has been a period of enormous changes and, also, a decade of gigantic efforts aimed at avoiding change at all costs. It is one of the many contradictions of our world. So, let me try to tell the story of these difficult years. - The acceleration of climate change. In 2005, climate change seemed to be still a relatively tame beast. The scenarios presented by the IPCC (at that time updated to 2001) showed gradual temperature increases and the problems seemed to be decades away - if not centuries. But 2005 was also the year when it became clear that limiting warming to no more than 2 degrees C was much more difficult than previously thought. At the same time, the concept that climate change is a non linear process started to penetrate the debate and the danger of the "runaway climate change" was more and more understood. 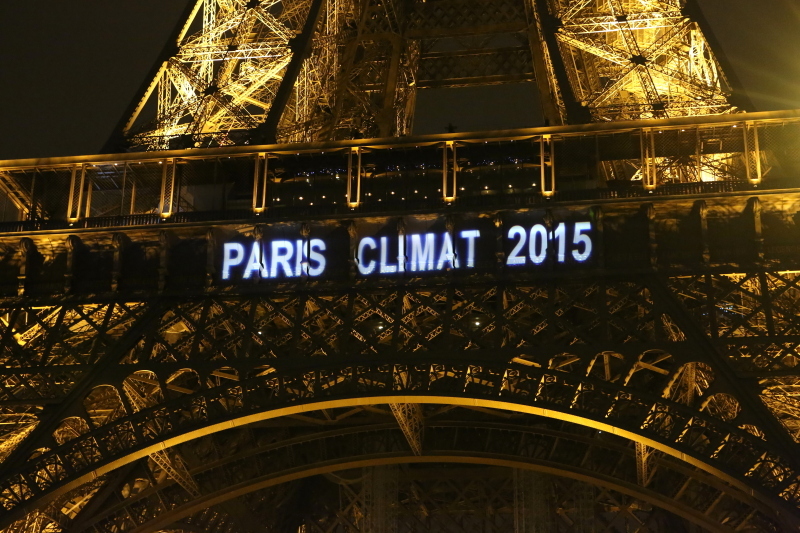 The events of the decade showed the rapid progression of climate change. Hurricanes (Katrina in 2005, Sandy in 2012, and many others), the melting of the ice caps, the melting of the permafrost, releasing its deadly charge of stored methane, giant forest fires, entire states going dry, the loss of biodiversity, the acidification of the oceans, and much more. It was found that high temperatures affect humans more than it was believed and, as a last straw, that the negative effects on the human behavior of increasing CO2 concentrations are much more important than previously believed. We are discovering with horror that we are transforming our planet into a gas chamber and we don't know how to stop. - The rise of denial. In 2005, the denial of climate science seemed to be in decline, to be buried in the dustbin of history by the accumulation of scientific knowledge on climate. It was not to be so. The campaign against science went into high gear, using the full range of propaganda techniques available. In 2008, we saw the so-called "climategate" scandal, possibly the most successful negative PR campaign ever mounted. 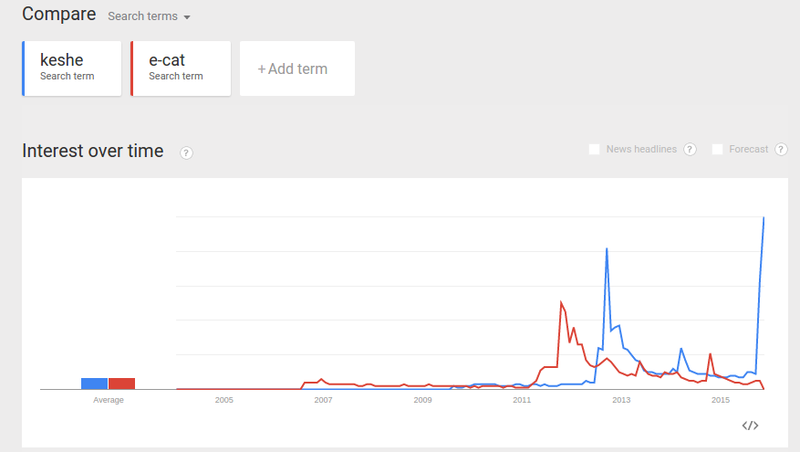 In 2011, the "pause" meme was diffused by the Daily Mail, and it was another remarkably successful propaganda attack. Then, individual climate scientists were harassed, demonized, investigated, and even physically threatened, while the public was the objective of a barrage of contradictory information destined to create uncertainty and doubt. The campaign was successful, especially in the US. During the 2012 presidential campaign, we saw both candidates avoiding the climate change issue as if it was laced with poison. And, in 2015, we see something never seen before: none of the Republican presidential candidates agree that climate change is caused by human activities, and that it is a problem. Denial remains a heavy burden to the attempt of doing something practical to stop climate change. - The peak that wasn't. In 1998, Colin Campbell and Jean Laherrere re-examined the ideas of Marion King Hubbert, who, in the 1950s, had introduced the concept of "peaking" for the production of crude oil. Their calculations indicated that the world peak - that they dubbed "peak oil" - would occur in 2004-2005. It was a reasonably good prediction in terms of "conventional" oil, which seems to have peaked between 2005 and 2008. But Campbell and Laherrere had not considered the role of "non conventional" oil; combustible liquids such as shale (or "tight") oil. Using these new sources, the production of "all liquids" kept increasing and that has made the concept of peak oil as popular, more or less, as Saddam Hussein was in the previous decade. The effort of the oil industry to produce from difficult resources led to various bad consequences for the ecosystem (remember Macondo in 2010? ), but the main one is that the CO2 emissions did not decline as a consequence of depletion, as it might have been expected. - The fading of green. In the 1990s, sustainability was still a fashionable idea and Green parties had considerable representation in many European parliaments. 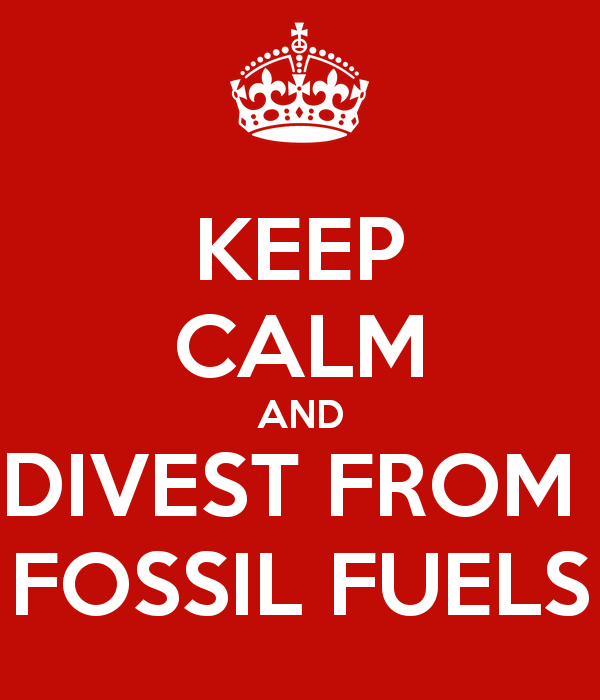 Over time, however, the political weight of the environmental movement has constantly eroded. The destiny of the Green parties closely follows that of all the ideas about environmental sustainability, which are not any more part of the arsenal of slogans of winning politicians. Even the European Union, once a bulwark of reason and of environmental consciousness, lost its focus,in particular with the mad hope of importing natural gas from the US. Most people all over the world seem to be so busy with their day-to-day economic worries, that they have no time or inclination to worry about an abstract entity called "the Environment", which seems to be an expensive luxury that we can't afford right now. It seems that the concept of "growth" has swept away the Environment everywhere as the thing to cherish most. - The financial collapse. The deep causes of great financial crisis of 2008 were never really understood and were reduced to contingent bad practices in finance. However, it was not just a financial crisis, it led the world's real economic machine to grind to a near complete stop. 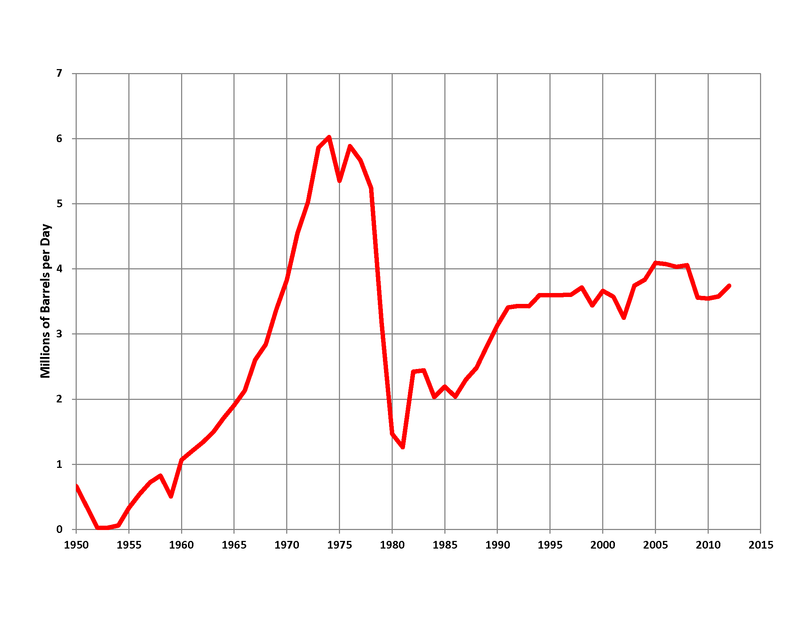 The crisis was overcome by printing more money and the economy restarted to work; but it never recovered completely. And nobody knows whether another financial collapse is around the corner and what could be done if it comes. The financial collapse showed the fragility of the whole system and it fixated the attention of most people on financial/monetary factors; often leading them to forget that there exists also a real world, out there, and that "the economy" is not just financial transactions, but it means providing material resources for society to survive. - The rise of conflicts. Military confrontation and violent strife are on the rise. We have seen tanks rolling in the very heart of Europe and an immense strip of land in a nearly continuous military confrontation, from North Africa to the Middle East, and all the way further to Afghanistan. Entire nations are crumbling down under massive aerial bombing and civil strife, producing hundreds of thousands of refugees fleeing. Is like a fire that flared once, and now is growing, engulfing one country after another. And nobody can say where the fire will stop, if it will. The only thing we can say is that destructive conflict tends to erupt in those states where the economy was in large part supported by the revenues from fossil fuel exports and where depletion led to the total or partial loss of this revenue. This was the case, for instance, of Egypt, Yemen, and Syria. The struggle may also be related to climate change and the consequent drought, as it is the case of Syria. We can't say for sure of all this is a harbinger of things to come in other places, but it might well be. - And more.... The above is not an exhaustive list of all the things that have been going on during the past decade. One could add the erosion of democracy and of personal freedom in the West, the decline or even the collapse of several national economies, the ongoing de-globalization, the increasing competition for rare and limited mineral resources, and much more. But all these events have a common origin. In all cases, people and institutions reacted to change by trying to stop it. For instance, facing the oil and gas depletion, the industry reacted by doubling the effort to find more at all costs, both financial and environmental. And they also stepped up its effort to deny the existence and the danger of climate change. Then, most people tried to solve their immediate economic difficulties by working hard and ignoring the deep reasons of their troubles. And here we are: after a decade of effort to ignore and contain changes, we are facing unavoidable and drastic changes. And we don't know how exactly to adapt to these changes. It is a difficult time that we are facing. 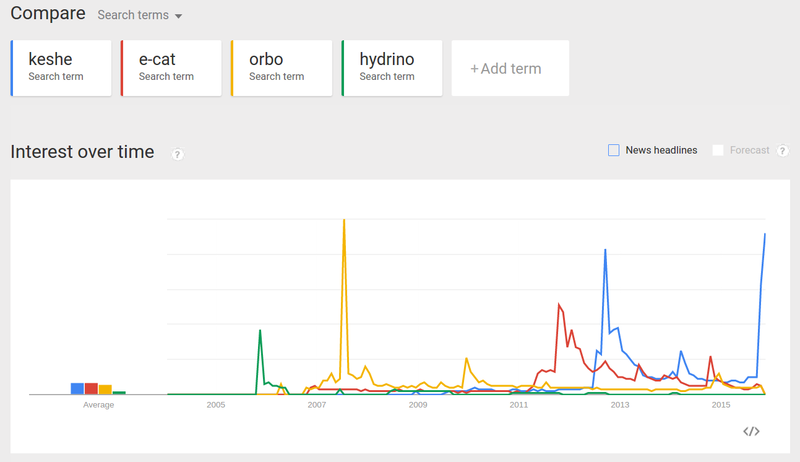 On the other hand, there has been at least one positive trend during the past ten years. - The renewable revolution. Solar and wind technologies have dramatically improved in terms of both costs and efficiency. There have been no technological miracles, just steady, incremental improvements. The result is that, in ten years, renewables such as silicon based photovoltaics and wind plants have grown from toys for environmentalists to serious technologies that can produce energy at costs competitive with those of fossil fuels. Renewable energy is the greatest hope we have for a non destructive adaptation to the unavoidable changes ahead. It will not be easy, but it is possible; we need to work hard on it.